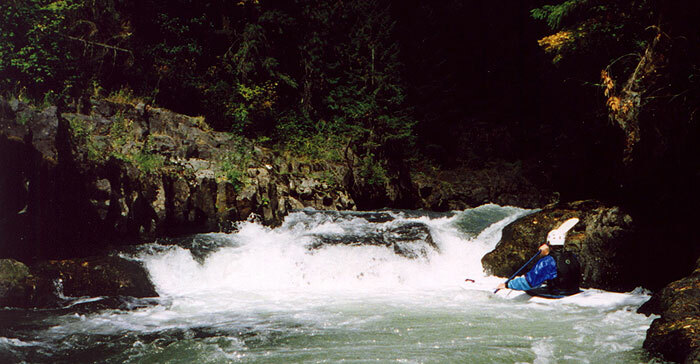 The upper section of Washington's White Salmon River has some of the finest summer class IV whitewater in the Northwest. Named for the farms near the put in, this run plunges through a spectacular vertical walled gorge. 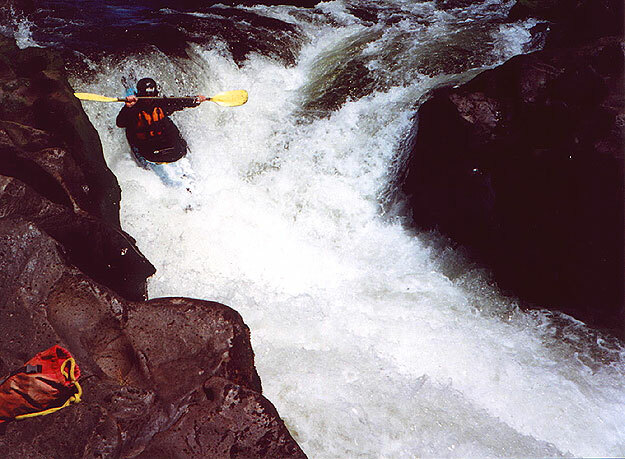 Many of the smaller drops must be boat scouted, but all of the more difficult rapids are easy to scout or portage on convenient rock ledges. There are two class five waterfalls on this run and one difficult class IV drop known as Sidewinder. All of these drops can easily be scouted and/or portaged. The put in on the Farmlands section. Most people opt for the short 5 foot seal launch at the put in, but on one trip Pete went into Batman mode and started scanning the surrounding cliffs for the highest seal launch possible. He found it... It may not be easy to tell from this photo, but he ended up boofing out and landing totally flat. The impact made a sound like a rifle shot, or was that his vertebrae compressing? Either way, pete is now two inches shorter. First-timers can find themselves feeling a little intimidated on this run as the rock walls close in, especially if no one in their group has done the run before. In most places the rock walls rise right out of the water, and this can overwhelm some paddlers. Below the put in there are some fun small drops, and then you arrive at the first real rapid, a fun, narrow plunge above Sidewinder. Pete disappears into the rapid above Sidewinder. A hundred feet below this first drop is Sidewinder. 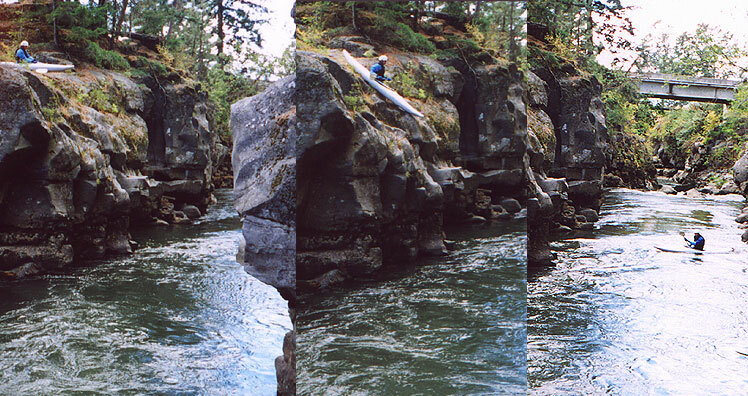 This difficult, twisty drop pushes hard into an undercut grotto ( the 'penalty box' ) on the river left wall. 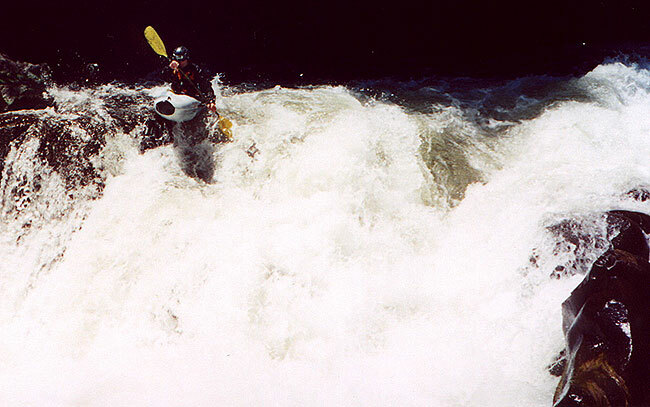 It is hard to run this drop with style as the currents are very powerful and tend to flip paddlers. Soon the walls start to soar overhead and paddlers encounter a series of class III/IV drops that can be boat scouted as necessary. The next big horizon line is the Doorbell, a fairly long rapid with a pointy rock at the bottom that points upstream like a knife. This rock doesn't start to poke it's head out until the flows get down below 3.5 feet on the Husom gauge. The trick is to avoid 'ringing the bell' at the bottom of this drop as the current hurtles you downstream towards it. Avoiding the rock gets harder at lower flows- Doorbell can be scouted and/or portaged on the left side. It should be noted that this drop and a couple just downstream get unpleasant at flows below three feet- all kinds of ugly piton rocks start to come up, so be careful! John charges downstream at Doorbell. This picture was taken at three feet on the gauge, and the 'doorbell' rock is in shadow, with the water spraying up off of it. Once you get past the Doorbell the action is fast and furious. There are many short, fun drops in the next mile or so above Big Lava Falls. The next major horizon line below the Doorbell is Little Lava, a short ledge that can be run left or right with speed. Just downstream is Lava Falls. At all but the highest of flows there is a flat pool above Lava, making the portage down the right side ledge a stress free exercise. This fifteen foot waterfall has changed in recent years and has become less forgiving. There used to be a hole in the top of the falls that most of the water poured into at lower flows, but it has become clogged with wood. Lava Falls is badly backcut and has a double hydraulic. I personally know three good boaters who have gotten stuck behind the falls a total of four times. 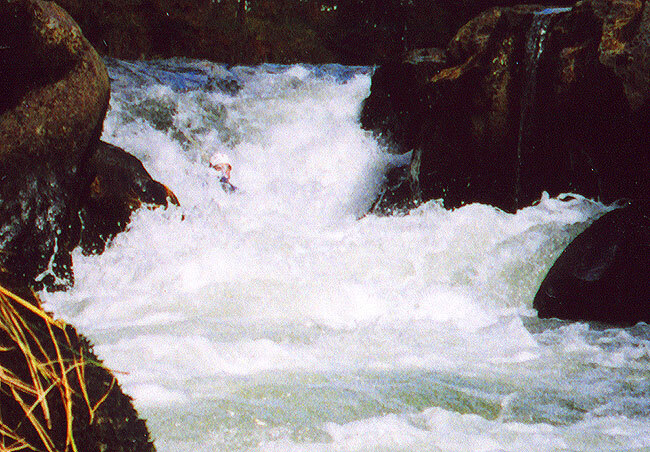 Boats and paddles are lost in the cave behind the falls every year, and boaters who miss the boof and get stuck behind the falls sometimes require difficult rescues. I know one guy who actually swam behind the falls with a rope to get his friend's boat back! Josh Knapp runs Lava Falls. 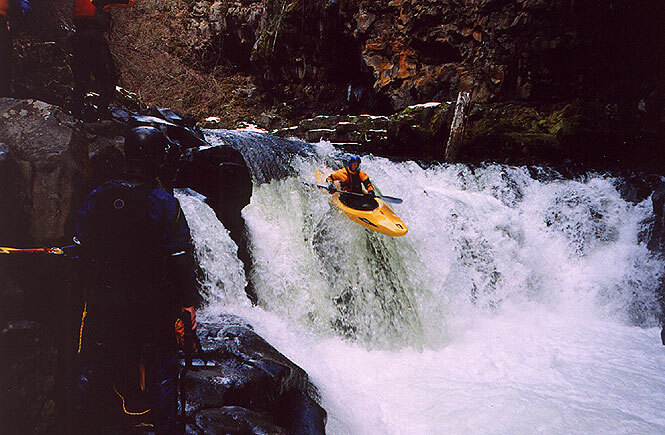 Jurgen Nickels run Lava Falls at high water in the Spring of 2002. 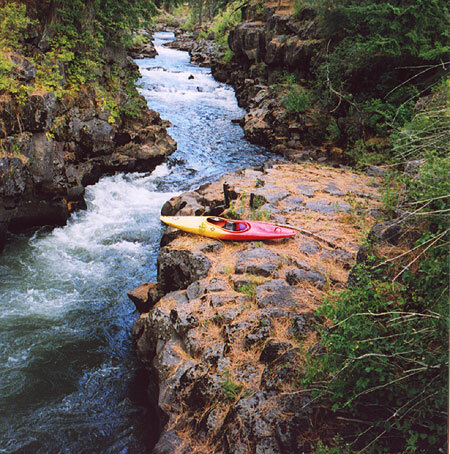 Below these drops the river mellows out for about two miles of class II rapids, allowing paddlers to relax and take in the scenery. As boaters approach Green Truss bridge the river starts to gorge up again and there are a series of short drops above Off Ramp. This difficult ledge is a recommended portage as most of the water is forced down into a horrible slot on the river left side that flushes against an undercut wall just downstream. John swears there is a stump jammed in this slot, which makes running Off Ramp a serious class V undertaking. The line here is about three feet wide, and if you miss you are going into the slot, like it or not! The lead in to the ledge is the scariest II+ drop you will ever run and requires catching an eddy along the right wall. Paddlers running this drop must run the lead in rapid flawlessly or they will end up getting stuffed into the slot. The portage along the left is not hard and is highly recommended by every guidebook I know of. Think long and hard before you run this one. The Author boofs hard at Off Ramp. All of the current to my immediate left flows down into the slot, which then flushes into the wall just downstream. I was reading and running everything from my boat when I came to a horizon line that looked just like all the others.... I could see the runout downstream and from the way the water was flowing I thought that the best line was left of center. What I couldn't see was that most of the current was flowing into a deep, violent 3 foot wide 10 foot long slot on river left, and that this was the worst possible place to be- the best line of all was far right, to avoid the slot. As I slid over the lip of the ledge I realized my mistake and tried to correct but it was too late- I crashed headlong into a protruding rock on the edge of the slot and spun around, falling stern first backwards into the slot! The slot was so narrow I hit the back of my head on the far wall hard enough to see stars as I went in deep, backwards and stunned... From the pool upstream, Mike said it looked like the Titanic sinking, only in fast motion. He said I dropped over the edge, stopped, then suddenly the front of my boat shot straight into the air and I dropped vertically out of sight! Panicked, everyone bailed out of their boats and ran downstream... I fell into the slot and was totally disorientated- I hit the narrow walls on either side of my boat with my paddle as I twisted around to set up my roll- I could feel the water pounding down on my boat from above so I figured I should just hang on and hope the exit of the slot wasn't blocked by debris. Luckily it wasn't and I flushed out into the pool below and rolled up with a sore neck and a new ding in my helmet. Pete looks up into the Toaster Slot. This drop should be run down the far right side at lower flows (3.5 ft and below) in order to avoid the slot on the far left, directly in front of Pete in this picture. Just downstream is the take out at Green Truss Bridge, or you can continue through the much more challenging Green Truss section. Dragging your boats up out of the gorge requires a rope and is hot, sweaty work in the summer. There are two possible remedies for this: First, some thoughtful person partially dammed a little creek near the parking area and boaters are able to rinse off in this little 'bathtub'. 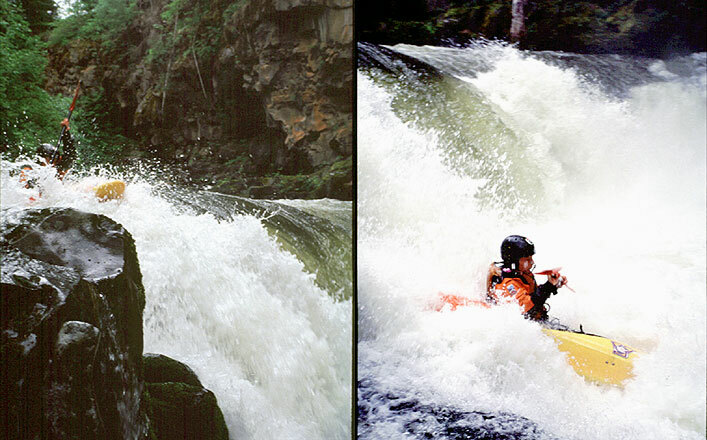 The second, (best) remedy is to load up the boats, drive downstream, and do a couple of laps on Husom Falls! 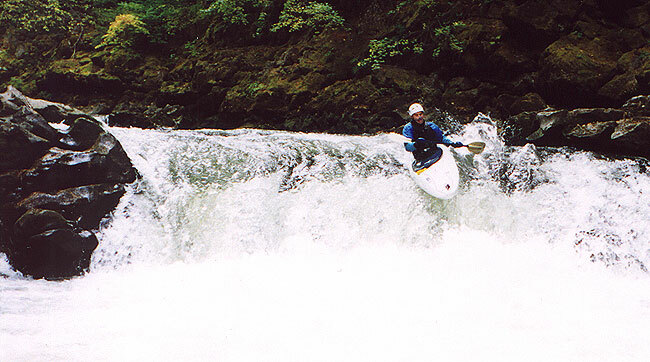 Flows: I always run this section in the summer when everything in Oregon is too low. The best (and easiest) flow is 3 feet on Pat Welches site. Any lower than this and two of the best rapids get too bony (Sidewinder and Off Ramp). In addition, it is pretty well accepted that this section gets much harder when the flows drop below 3 feet. 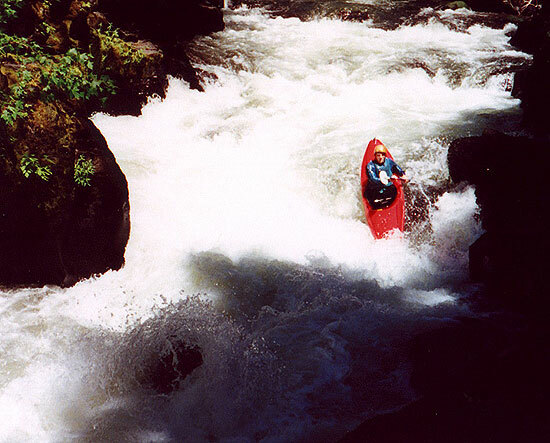 Many of the rapids are fast chutes, and once it gets too low evil rocks start poking up, just waiting to surprise you. Do yourself a favor and run this section at (at least) 3 feet the first time- you'll thank me later!